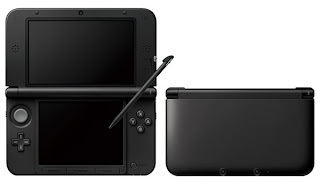 This past Sunday Nintendo released their 3DS XL handheld in an all black color. Before then if you wanted the XL your options were the dual colored red/black, blue/black, or pink/white. There were also a few limited editions tied into game releases, most of those go for absurd ammounts of money now though. I’ve been looking at the 3DS XL for a couple months now, and the all black version was coming out right when I was getting ready to purchase one anyway, so it worked out perfectly for me. Thursday I had taken off work so I decided to head down to Best Buy and see if anyone had accidentally put one on the shelves early. I had seen pictures of a few stores breaking street date, so I figured I’d try. Unfortunately they only had the current versions out. After flagging down a helpful worker I played dumb and asked if they had the black model. They did have it in stock, but the system showed it wasn’t allowed to be sold until the eleventh. She then asked if I’d like to pre-order it. Because I’ve played this game before I asked if I was guaranteed one on Sunday if I pre-ordered now. She checked her stock again and said yes, that there was no doubt in her mind that if I pre-ordered I’d get a system. Believing what I was told I walked over to the pre-order kiosk and printed off a receipt. I then took the receipt to the cashier so I could put my five dollars down. And it wouldn’t ring up. He tried two or three times before going to ask someone else what was going wrong. He gets told to create a new pre-order and ignore the ticket. That doesn’t work either. I want to stress at this point, everyone I’ve dealt with has been very nice. I’m not impatient or rude either, I really didn’t have anything to do that day anyway. A manager and someone else come in to try and help. Everything the original cashier tried fails for them too. My name and rewards information is written down as the manager goes to the customer service area and tries to enter my pre-order off Best Buy’s website. That doesn’t work either. Finally the manager gets fed up and runs to the back of the store. I see him two minutes later carrying the 3DS XL. Inwardly I’m celebrating. I watch as he starts ringing it up. I’m celebrating because I don’t go back to work until Monday, that’s four days to goof off with my new toy. And the system won’t let him sell it early. Fuuuuuuuuuuuuuuuuuuuuuuuuuuuuuuuuuuuuuuuuck. Defeated the manager writes my name and phone number on a piece of paper and then tapes it onto the box. He apologizes and tells me that the system will be there for me to pickup Sunday. While my weekend dreams are crushed, I tell him that’s fine and head off. Sunday morning rolls around and I’m up early to get to the store. My 3DS and the manager’s note are nowhere to be found. There were plenty of black 3DS XLs on the store shelves though. The system is worth all the frustration though. Nintendo knows what they’re doing when it comes to handhelds. If you haven’t picked one up I highly recommend it. Again I want to end this with saying I’m not mad at anyone who helped me Thursday or Sunday. I find the whole thing rather funny, although I probably would have felt differently if I didn’t end up with the 3DS I wanted.